ACTOR SIR JOHN Hurt, who could move audiences to tears in The Elephant Man, terrify them in Alien, and spoof that very same scene in Spaceballs, has died. He was 77. Hurt, who battled pancreatic cancer, died yesterday in London, according to his agent Charles McDonald. Twice nominated for an Oscar for playing the tortured John Merrick in David Lynch’s The Elephant Man and for his role as the heroin addict Max in Midnight Express, Hurt’s career spanned over 50 years. After minor television and film appearances, his breakout came in 1966 as Richard Rich in Fred Zinnemann’s A Man For All Seasons, followed by his portrayal of Caligula in the BBC miniseries I, Claudius in 1976. The British actor brought gravitas to Alan Parker’s 1978 film Midnight Express, for which he received a supporting actor Oscar nomination (he lost to Christopher Walken for The Deer Hunter) and an uneasy humour to Kane in Ridley Scott’s Alien. Hurt had Irish links and previously lived in Wicklow. He had been married to Anwen Rees Meyers for 12 years. Hurt is unrecognisable in perhaps his most memorable role as the lead in The Elephant Man. He endured eight hours in the makeup chair daily to transform into John Merrick. The elaborate mask prohibited him from sleeping, lying down or even eating while it was on. His would eat his last meal midmorning as the mask was being applied — usually raw eggs mixed in orange juice — and not again until after midnight. “To be quite honest, the film was misery to make because of the physical problems, so if it’s working I’m jumping for joy,” Hurt said in a 1980 interview. Hurt did score a lead actor Oscar nomination for the role, but lost out to Robert De Niro’s performance in Raging Bull. Hurt was a prolific voice actor, appearing as Hazel in the animated Watership Down, and as Aragorn in Ralph Bakshi’s The Lord of the Rings. He voiced The Horned King in The Black Cauldron and provided the narration for Dogville. He also starred in Jim Sheridan’s 1990 Irish drama The Field. In the Harry Potter films, Hurt played the wand-maker Mr Ollivander. In recent years, he appeared in notable fare such as Melancholia, Tinker Tailor Soldier Spy, Only Lovers Left Alive and Snowpiercer. As prolific as ever, Hurt recently appeared alongside his V for Vendetta co-star Natalie Portman in the Oscar-nominated film Jackie as a priest who consoles and advises the recently widowed first lady. Hurt leaves behind a few in production credits, including Joe Wright’s Darkest Hour, which is listed as still filming. Hurt plays Neville Chamberlain in the film about Winston Churchill’s charge against Hitler. Gary Oldman plays Churchill. “I have lots of favourite memories but I can’t say that I have a favourite film. I have favorite parts which are not in particularly successful films,” Hurt told The Guardian in 2000. 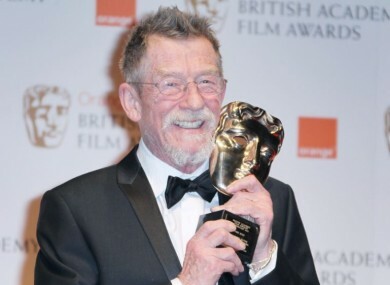 Email “John Hurt, star of Alien and Harry Potter, dies at age 77”. Feedback on “John Hurt, star of Alien and Harry Potter, dies at age 77”.